Rich and Melissa were great and a lot of help! had a stressful (because how can it not be, right) but ultimately great experience at Doug's. My sister worked for them before she passed away and they treated her so kindly. Thank you to Rich McGill and Melissa McKinnon for your patience and kindness as well as your willingness to work within my budget. I'll be back. Travis was awesome!! He came in on his day off and was willing to work with our situation. He kept everything honest and didn't try to talk us into something we weren't comfortable getting into. Rich has been great helping me with the purchase of my new car today. Very courteous! Very professional! RICH WAS A GREAT HELP IN GETTING US INTO A CAR. SUPER NICE GUY AND VERY HELPFUL. I AM SO GRATEFUL FOR HIS HELP AND EVERYONE'S HELP AT DOUGS! THANK YOU EVERYONE! Michele was great! Fast, easy & honest! She really had the knowledge! Michele was very helpful. Made the buying process easy for a first time buyer like me. Great Service! 10 out of 10 would be recommended! Michele was very down to earth. Her determination and willingness to help us was fantastic. I love that there was no pressure and that we left happy. She is amazing. Rich was very personable and found us the car we wanted. No pressure and it was a really good buying experience. All over amazing experience. Everyone that helped me was very friendly. They worked with me and my budget. Very satisfied and will be recommending to others. Ken was great!! Great Experience here at Dougs. Travis was really great! Second time car buyer at Doug's Credit Center. Always treated with fast friendly service. Love my new Car!! Great Customer service. Very welcoming and made me feel at home. Work very hard on getting a great deal. Very satisfied with every aspect of this experience. Thank you Travis! 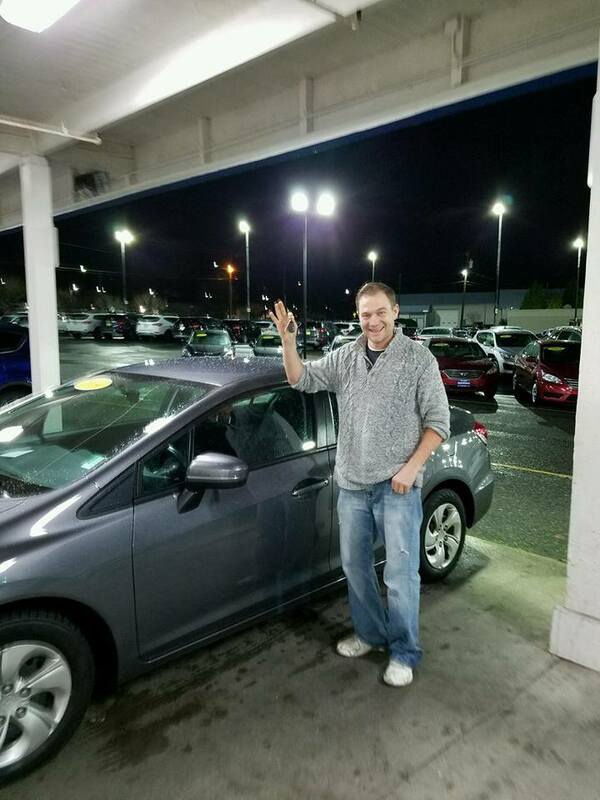 Rich was very helpful and went above and beyond to find us the right car at the right price! Travis was great!! Dougs Credit Center was easy to do business with! Great Customer Service! Thank you for your help!! Doug's Credit Center was very fast is securing a loan for someone with only 2 months on the job and little to no credit. See Travis and Rich, they are true professionals. Awesome sales service, took time to buy the car but everything worked in our favor. Service was able to help in the shop also. Would recommed to others!! Everything went very well. We were treated very fairly. Thank you very much. I came in with very serious doubts taht this company could help me, my situation was. I bought a new car (somewhere else) and was very very unhappy with the new car. Mr. McGill did everything in his power to help me get out of the new car and into another car all with the amenities that I had requested from the first dealership. He was very successful and helpful with the whole deal. Very Kind, Honest, Informative, and Courteous. Kept us entertained-let me know what to expect & helped me find something that fit my budget and credit situation. Super Peeps!! Worked hard to get me a good reliable car at a good price. They worked with my credit score and got a great car. The experience was wonderful and the SERVICE employee was very helpful. I personally hate car shopping. By far this was the easiest car purchase we have had. You did a great job!! Great Customer Service. Worked with me in a difficult time and with a tricky situation. Thank you guys so much!! Came in while in a Chapter 13 bankruptcy. Was approved for a better car than I thought I would get. Wasn't approved anywhere else, but was here. Thanks Dougs!! I have excellent credit and Doug's Credit Center was able to find me a good deal on financing for a used vehicle.Very efficient and a pleasure to work with. Great experience at Doug's Credit Center. No hidden costs or surprises. Jeff listened to our needs and budget. He did not get us into something we couldn't afford. No junkers or high milerage cars, cars are 1-5 years old. Highly recommended!! I was very pleased with the amount of effort this company and its associates showed in helping me the car. After other refusals, it was great to find a company that worked this hard. Thank you very much. They were very helpful and worked with us to get us into a much-needed car. Would recommend to anyone and everyone! Adrian Astelean has an excellent personality! Gave us all the information we needed on the car. We filled out our information online. We were called by Steve. We came in with our situation. He was patient, kind and friendly. We told him what we wanted and, after some negotiating, we ended up with our first choice. I will be recommending Steve and Doug's for sales and financing. Steve ROCKS my world. Fast, great and friendly. Todd helped me reestablish my credit which is much needed. I will return when I purchase my next car because of the outstanding service. I would recommend Doug's Credit Center to anyone that has poor credit, like myself. Everyone in there office is more than helpful. The man that helped me through this process is Gordon Oxendine. He is someone who you can really talk to. Bill was very patient. He took time to explain everything about our deal. He never once tried to offer or do anything that wasn't in our best interest. Chris was very friendly and helpful, very comfortable to talk and deal with. I enjoyed my experience working with him. I will keep my business with him and refer others as well. Thank you so much.